2011 marks the 25th anniversary of the Grand River Spinners and Weavers Guild. Weavers Guild. 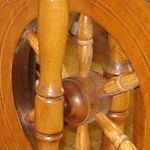 It is presented for the “Best Skein by a Novice Spinner” at the Ontario Handspinning Seminar held in June each year. Dianne Paquette who was an enthousiastic and prolific spinner and weaver who provided leadership for this guild. She was the librarian for the past few years and did a lot to organize and improve the library. She passed away in a car accident with a moose. The library will be formally named after her and an annual donation of $50.00 will be made to expand the library collection. Chris Bell was a potter, spinner, weaver, artist in every way. Although she was not a member for very long she brought enthusiasm and creativity to us every time she was with us. She was lost to cancer.